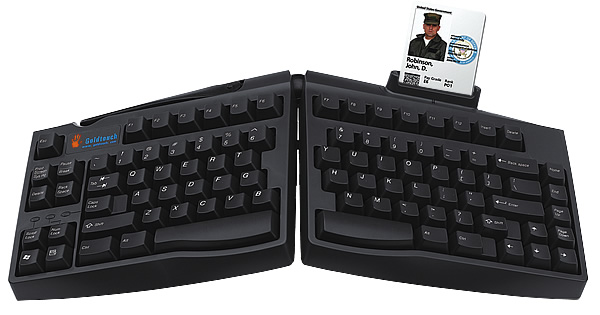 Goldtouch the leader in ergonomic computer peripherals, introduces the ErgoSecure SC2.0 adjustable keyboard. By integrating smart card technology for positive verification of user identity, ErgoSecure combines proven ergonomic design with a high level of access, communication and transaction security. The patented, segmented Key Ovation keyboard is the most advanced device of its kind. Simple to adjust, it permits the user to change the configuration both horizontally and vertically, reducing discomfort for the user. ErgoSecure SC2.0 from Key Ovation. A user-friendly, security solution that's easy to use, easy to implement and provides the enterprise with two levels of protection. Key Ovation ErgoSecure SC2.0 utilizes the SCM STC II chip Smart Card reader. This technology is compliant with many crucial existing and emerging banking and IT standardsand supports a wide range of e-commerce, authentication, PKI, and network security based applications. Continuously variable adjustment for wrist pronation as well as wrist splay in 0"-30" vertical tenting as well as horizontal 0"-30"
Compatible with Windows 7 and greater, 2000, XP,Vista and Win 7.